Ninjak is the world’s greatest master spy. He knows a thousand ways to kill a man. And, on May 20th, he’s going to need every single one! Valiant is proud to present an advance preview of NINJAK #3 – the next 40-page chapter of the explosive ongoing series from New York Times best-selling writer Matt Kindt (THE VALIANT, DIVINITY) and superstar artists Clay Mann (X-Men) and Butch Guice (Captain America)! 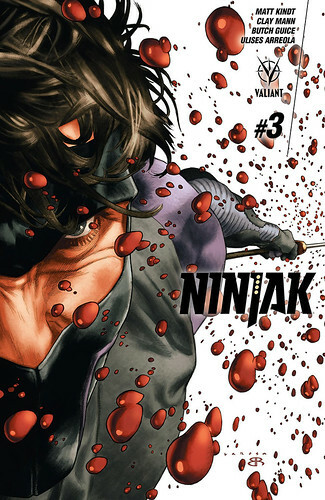 On May 20th, the most jaw-dropping series of the stands unleashes its next brutal wave of ninja-on-ninja action as Ninjak's war on the Weaponeer arms cartel erupts into open conflict…and MI-6's most elite intelligence agent gets ready to betray everything he's ever known! Ninjak went to Tokyo to destroy Weaponeer from the inside out…by claiming a seat on their secret crime council of shinobi masters, the Shadow Seven, for himself! Now, as he continues his quest to conquer the world’s most dangerous weapons dealer one member at time, Ninjak is going to require each precise tool in his arsenal…and every deadly skill he’s ever learned. Colin King is about to enter the fight he’s been training for his entire life.